Tamil Nadu School Education Board has published the exam time table for HSC students on the internet at dge.tn.gov.in. Students and private candidates can download Tamilnadu 12th Time table 2019 for March exam from online. 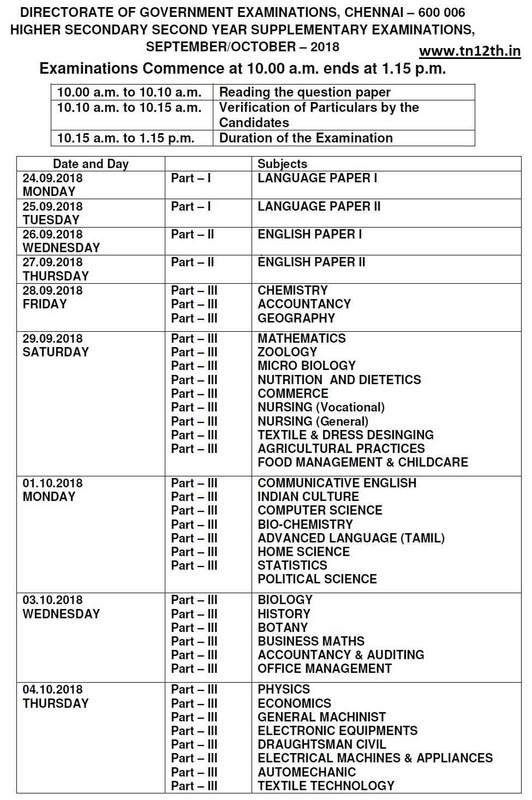 English medium and Tamil medium students both having the same exam dates for all subjects. The private candidates those who applied for the public exam March 2019 directly also follow the TN Plus Two exam schedule given below. Students who failed in previous year board exam and supplementary (attempt) exam also applied for March 2019 board exam. You can also follow the same exam dates given below for all subjects. 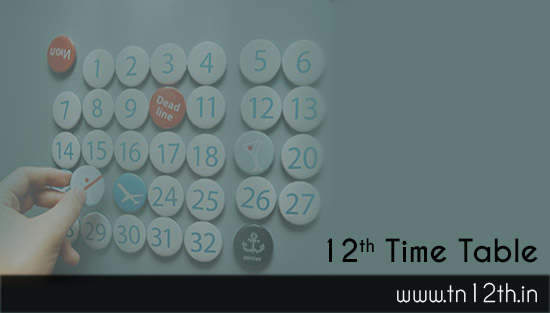 If you want to know practical exam date and time, then visit the exam centre and ask respective staffs. The Directorate of Government Examination will conduct public examination for the students those who are currently studying 12th standard and privately applied for board exam. So the TN HSE school education board released the exam date and schedule for both theory and practical exam online. As per the time table, practical exam starts from February 2019. There are two different batch allotment for practical exams in Tamilnadu. 10.10 am – 10.15 am : Filling necessary details in answer sheet. 10.15 am – 12.45 pm : Exam duration 2.30 hrs. School practical subjects (Physics, Chemistry, Botany, Zoology, Biology and Computer Science) staffs will provide you the exact date and time (shift) of practical exam. The TN DGE published theory exam dates online at official website. According to the time table of theory exam starts from 1st March 2019 and ends on 19th March 2019. 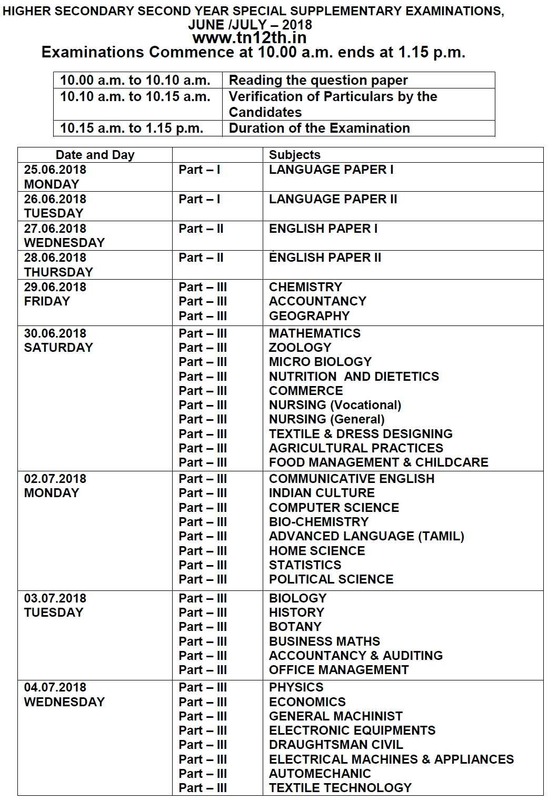 You can get TN HSC Time table March 2019 for all subjects from the schedule pdf. Note: 12th special supplementary (attempt) exam time table September / October 2018 released. HSC attempt exams will be held from 24th September to 4th October 2018. All students including regular, private and supplementary or attempt exam candidate can download the HSC time table using below download link. Click on the link and save it as pdf file to check it later. Maths ku oru naal thaan leave aaa Sir it's tough to study pls give at least two days Sir pls Sir. ..